If your car or truck has the dreaded check engine light come on than there is Do-It-Yourself scanner tools that can show the problem. 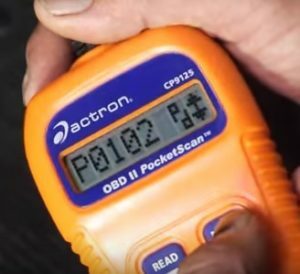 All cars and trucks built after 1995 come with a built-in port called a OBD2. 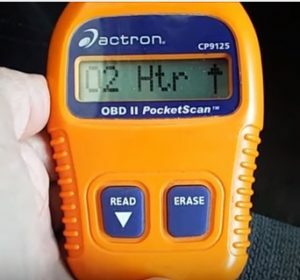 The OBD2 port talks directly to the vehicles computer and when used with a OBD2 scanner tool displays the problem with the engine. The OBD2 port and scan codes are universal across all vehicles so the same P0102 code (Mass Airflow Sensor) on a Dodge will be the same problem on a Toyota. Most all OBD ports are located under the dashboard on the driver side and simply needs a scanner tool to plug into the connector and decode the codes. A nice low cost unit is the Actron CP9125 PocketScan Code Reader which is a good tool for the Beginner or advanced user. It is a all-in one unit and can read codes and clear them from most any vehicle built after 1995. Read Full Review Here On the Actron CP9125 PocketScan Code Reader. There is also Bluetooth scan tools available that work in combination with a smartphone or laptop and display codes. These small Bluetooth OBD2 Dongles are good for occasional use and are very low cost. Read Here For full Review on OBD2 Bluetooth Dongle. 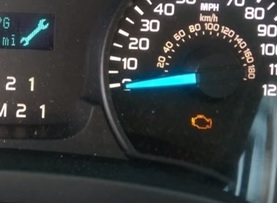 Finding out the meaning of a check engine light is a easy do-it-yourself task that most anyone can do. A scanner tool will be needed with many options available depending on your budget. If you are on a very low budget keep in mind many auto part stores will run a scan of your vehicle for free. Be sure to call your local auto part store to be sure but most likley they will offer some type of assistance. Bluetooth scanner dongles are very popular since they are very low cost and when paired to a smartphone or laptop can show the problem with any car or truck. As always before buying any OBD2 device be sure to read the reviews on Amazon, forums, or elsewhere to be sure it is the right fit for you.